By adding bits of irradiated plastic water bottles to concrete, MIT engineers take plastic out of landfills and lower the cement industry’s carbon emissions. 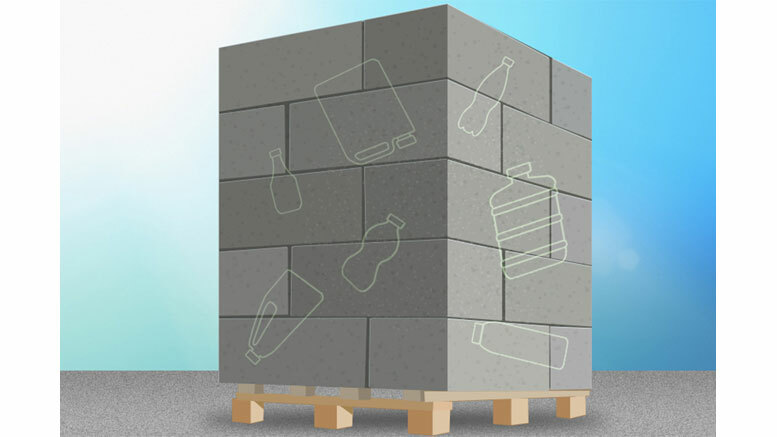 Discarded plastic bottles could one day be used to build stronger, more flexible concrete structures, from sidewalks and street barriers, to buildings and bridges, according to a new study. Concrete is, after water, the second most widely used material on the planet. The manufacturing of concrete generates about 4.5 percent of the world’s human-induced carbon dioxide emissions. Replacing even a small portion of concrete with irradiated plastic could thus help reduce the cement industry’s global carbon footprint. Reusing plastics as concrete additives could also redirect old water and soda bottles, the bulk of which would otherwise end up in a landfill. The team includes Carolyn Schaefer ’17 and MIT senior Michael Ortega, who initiated the research as a class project; Kunal Kupwade-Patil, a research scientist in the Department of Civil and Environmental Engineering; Anne White, an associate professor in the Department of Nuclear Science and Engineering; Oral Büyüköztürk, a professor in the Department of Civil and Environmental Engineering; Carmen Soriano of Argonne National Laboratory; and Short. The new paper appears in the journal Waste Management. Schaefer and Ortega began to explore the possibility of plastic-reinforced concrete as part of 22.033 (Nuclear Systems Design Project), in which students were asked to pick their own project. The students learned that others have tried to introduce plastic into cement mixtures, but the plastic weakened the resulting concrete. Investigating further, they found evidence that exposing plastic to doses of gamma radiation makes the material’s crystalline structure change in a way that the plastic becomes stronger, stiffer, and tougher. Would irradiating plastic actually work to strengthen concrete? To answer that question, the students first obtained flakes of polyethylene terephthalate — plastic material used to make water and soda bottles — from a local recycling facility. Schaefer and Ortega manually sorted through the flakes to remove bits of metal and other debris. They then walked the plastic samples down to the basement of MIT’s Building 8, which houses a cobalt-60 irradiator that emits gamma rays, a radiation source that is typically used commercially to decontaminate food. The team exposed various batches of flakes to either a low or high dose of gamma rays. They then ground each batch of flakes into a powder and mixed the powders with a series of cement paste samples, each with traditional Portland cement powder and one of two common mineral additives: fly ash (a byproduct of coal combustion) and silica fume (a byproduct of silicon production). Each sample contained about 1.5 percent irradiated plastic. Once the samples were mixed with water, the researchers poured the mixtures into cylindrical molds, allowed them to cure, removed the molds, and subjected the resulting concrete cylinders to compression tests. They measured the strength of each sample and compared it with similar samples made with regular, nonirradiated plastic, as well as with samples containing no plastic at all. They found that, in general, samples with regular plastic were weaker than those without any plastic. The concrete with fly ash or silica fume was stronger than concrete made with just Portland cement. And the presence of irradiated plastic strengthened the concrete even further, increasing its strength by up to 20 percent compared with samples made just with Portland cement, particularly in samples with high-dose irradiated plastic. After the compression tests, the researchers went one step further, using various imaging techniques to examine the samples for clues as to why irradiated plastic yielded stronger concrete. The team took their samples to Argonne National Laboratory and the Center for Materials Science and Engineering (CMSE) at MIT, where they analyzed them using X-ray diffraction, backscattered electron microscopy, and X-ray microtomography. The high-resolution images revealed that samples containing irradiated plastic, particularly at high doses, exhibited crystalline structures with more cross-linking, or molecular connections. In these samples, the crystalline structure also seemed to block pores within concrete, making the samples more dense and therefore stronger. Going forward, the team is planning to experiment with different types of plastics, along with various doses of gamma radiation, to determine their effects on concrete. For now, they have found that substituting about 1.5 percent of concrete with irradiated plastic can significantly improve its strength. While that may seem like a small fraction, Short says, implemented on a global scale, replacing even that amount of concrete could have a significant impact. “This research is a perfect example of interdisciplinary multiteam work toward creative solutions, and represents a model educational experience,” Büyüköztürk says. 1 Comment on "MIT Engineers Cut Carbon Emissions by Adding Recycled Plastic to Concrete"